The first heat went well. The American 4X400 relay team at the 1964 Tokyo Olympics won handily against the Soviet Union and France, finishing a full 2 seconds ahead of the Soviets. Henry Carr led off, followed by Ollan Cassell, Mike Larrabee and Ulis Williams. Thus, America was favored to take gold. After all, Carr was the gold medalist in the 200 meter finals. Mike Larrabee was the gold medalist in the 400 meter finals. Williams was a finalist and placed fifth in the 400-meter finals, while Cassell nearly qualified for the 400-meter finals. Williams ran the anchor leg on the team, and in fact had always run the anchor leg in his career. Even at Arizona State University, where he and Carr were teammates on the track team, he had always run anchor. But he was concerned enough to ask the US track coach, Bob Giegengack, to hold a team meeting before the 4X400 relay finals. “I told the team I was not feeling how I would like to feel, and didn’t feel I was running my best, that I wanted to make sure that we had the best chance to win the gold medal.” In other words, he implied that he might not be the best choice as anchor for the finals and that he would run in any place the coach wanted him to run. So with the decision to replace Carr with Williams as the anchor, 400-meter champion Larrabee spoke up and said he wanted to run second. According to Williams, it is a common tactic to place your fastest runner second, and so Larrabee thought that he could give a significant lift by building a lead in the first half of the race. With those two decisions, Williams slotted into the third leg, and Cassell took the opening leg. And the rest is history. Although there was a slight hiccup in one of the exchanges, the Americans won gold in the world record time of 3:00.7 seconds, with Henry Carr blazing to the tape, the team finishing essentially a second faster than the teams from Great Britain and Trinidad and Tobago. The 1972 Munich Olympics will forever be associated with the most horrific clash of political values during an Olympiad, one that resulted in the murders of 11 Israeli coaches and athletes at the hands of Palestinian terrorists. While Iron Curtain Spy-vs-Spy shenanigans had been part and parcel of the Olympics in the 1950s and 1960s, and the rhetoric was heating up as the nuclear arms race injected legitimate fear into the lives of ordinary folks, the venues and facilities of the Olympic Games had been sacrosanct, places off limits to tribal conflict. Countries come together in peace during the Olympics. Heck, Nixon went to China that year! Maybe things were getting better. And so, in hindsight, we can look back on the security of the 1972 Munich Games and pronounce them horrifically bad by today’s standards. Ollan Cassell was at the Munich Summer Games. Cassell, a gold-medal winning member of the US men’s 4X400 relay track team, was the recently appointed executive director of the then American Athletic Union (AAU), which at the time, was the US body recognized internationally in 14 sports represented at the Olympics. Cassell gave a first-hand account in his book, Inside the Five Ring Circus, how lax the security was in Munich. At the Munich Games, the ticket takers apparently returned the ticket stubs back to the ticket holder, in essence, giving back the ticket. Perhaps the ticket takers were being nice, thinking that the spectator would want the full ticket as a souvenir and a pleasant memory of their time at the Munich Games. Cassell wrote how he took advantage of that security flaw to get a member of his team into the Opening Ceremonies by going to the fence and handing his ticket stub to his team member, who then easily entered the Olympic stadium with a “valid” ticket. Not only that, Cassell wrote about how easy the official credentials were to forge. With some care, Cassell wrote of how people created their own credentials to gain access to events more freely than they were initially able to do. He did write about how one person got caught with the fake credentials and was deported, but on the whole, security was filled with holes. Yes, tight security is a pain in the neck. And who knows, maybe the organizers of the Munich Games, perhaps in some way, were trying to overwrite the world’s image of Germany’s last Olympics – the Berlin Games – by prioritizing a relaxed attitude over a vigilant attitude. But reality slammed home. The Black September terrorists who came to Munich to kill Israelis, took advantage of the security. They had stolen keys that gave them easy entry to the rooms of the Israeli men’s team. They entered the Village grounds in the first place by doing what other athletes did after curfew – by climbing the fence. The thought that terrorists would break into the Village was so remote that other Olympic athletes apparently helped the Palestinians in. There was criticism as well for the German authorities who struggled to contain the hostage crisis, and were, in hindsight, poorly prepared to handle this armed conflict. And yet, they were poorly prepared because they did not believe such a thing could happen at their Olympics. The rhetoric of geo-political spats gave way shockingly to savagery and death at the Olympics. And security at the Olympics would be changed forever. I am enjoying the book, Inside the Five-Ring Circus, by 1964 Olympian, Ollan Cassell, and I recently read this delicious tidbit about double-gold medalist Olympic legend, Bob Hayes. In 1964, the fastest man in the world in 200 meters was Henry Carr. As Cassell explained, Carr won the US trials for the 200 meters in New York in the Spring. But the US Olympic track and field authorities held a second trial in Los Angeles in the summer, and Carr was unfortunately out of condition, finishing fourth in the trials. Since the top three qualified for the Olympic squad, Carr was unexpectedly off the team. Hayes of course went on to take gold in the 100 meters and 4×100 relay in spectacular fashion. But his gracious act continued to pay dividends. Rejuvenated, Carr was looking strong prior to his races, in shape, and ready to win. Not only did Carr set an Olympic record in the 200 meters, he anchored the US men’s 4×400 relay team, blazing to a world record finish. In his book, No Bugles No Drums, Olympic track legend, Peter Snell of New Zealand, wrote about an underground tunnel at the National Olympic Stadium, where he competed at the 1964 Olympic Games. Cassell asked me to confirm that his memories were correct, so I did some digging. After a few emails exchanged between me and The Japan Sport Council, the government body that manages and operates some of the largest sports facilities in Japan, including the National Olympic Stadium, I was pleasantly surprised to get confirmation on the tunnel. Not only that, the Japan Sport Council was kind enough to provide a schematic and photos. The National Olympic Stadium has been torn down, a new one set to rise (once a plan is finalized). But the old one apparently had a trick under its sleeve. It will be missed. To see what the stadium looked like just before it was torn down, check out these 360 views of the stadium. At every Olympics, there are people who stand out brighter than others. In 1964, everybody had a Billy Mills story. 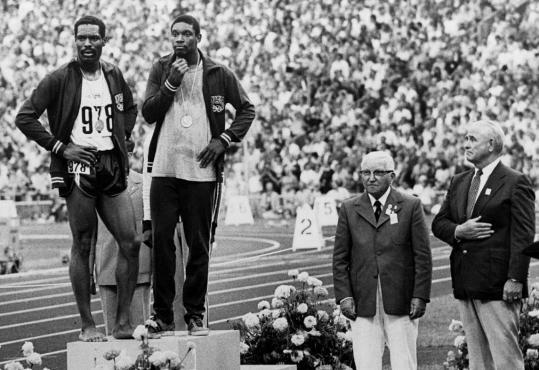 The legendary Native American champion of the 10,000 meter race, Mills was not expected to medal in Tokyo, and thus appeared to come out of nowhere to win one of the most dramatic races in Tokyo.